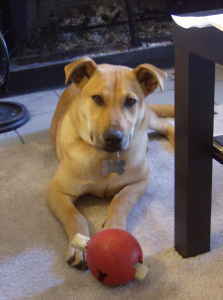 Nala is a sweet little dog who was very shy and skittish when she was first adopted from a rescue. In 2008, Christina was out for a walk with Nala when she slipped and fell. The impact knocked the leash out of her hand, and Nala took off in a panic. Christina did everything right before losing Nala and while she was lost. Unlike many lost pet situations, like when I lost Porter and Tess, and Charlie, and Fozzie, and Viktor (have I really managed to lose that many pets? ), where the pet owner made an obvious mistake, Christina absolutely did everything right for Nala and still lost her. Christina did not panic. She immediately got online to look for help, and came upon Missing Pet Partnership. She followed our advice about signage, and went a step further: she had magnetic signs made for her car, advertising her lost dog. She went around the neighborhood with fliers and handed them to everyone. Kelsy was not yet fully trained to find lost dogs, so she hired someone with experience, who drove here from Arizona. The search dog was able to establish part of the trail, but couldn't catch up to Nala after many hours of searching. Christina later learned that Nala was coming back around near their apartment, and she was often seen along the edge of the neighboring golf course. We tried humane traps, but Nala was reluctant to go in. Missing Pet Partnership had a device called the Collarum trap. It is a steel cable that works as a snare, tightening up when the dog pulls away. The cable on the Collarum trap is the same as that used on catch poles that animal control officers use every day. It is spring loaded, and it shoots over the dog's head when she pulls on a lever covered with an irresistible scent. It is an ingenious device, highly engineered and precise. It comes with extensive instructions, and a DVD that clearly shows how it should be used. It also comes with a warning that a dog could possibly be hurt by the trap, although that rarely happens. I brought the Collarum trap to Christina, but I couldn't stay long enough to help her set it up. I explained that if it was used wrong, it would not work. We had tried it with Sophie, the Bernese Mountain Dog, (she was the reason MPP bought the device) and it had failed because Sophie's owner did not follow the instructions about limiting the avenue of approach to the trap so that the dog comes at it straight on. Christina, who by her nature always does things the right way, assured me that she would follow all of the instructions to the letter. She waited until dark, because that was when Nala was known to come around. Christina set up the trap in the landscape at the edge of the golf course, and as she was walking away to get in position to watch from a distance, she heard the trap spring, and she heard a surprised yip. She ran back, and there was Nala in the trap! Christina was very persistent and thorough, and she was never going to give up on Nala. She kept trying various methods and ideas to get her dog back until she found one that worked. After that, Christina walked Nala with two leashes, one attached to a collar and one attached to a harness. Christina would hold one leash in her hand and the other leash was attached to her belt. In the last seven years, Nala has never escaped from Christina again. After this successful use of an effective trapping method, Missing Pet Partnership was informed that the trap was illegal according to a Washington State law that was intended to prevent trappers from killing game animals in a cruel manner. Obviously, this law was not written with the safe capture of domestic dogs in mind. MPP asked the Department of Fish and Wildlife for an exemption so that we could use the snare trap to catch lost dogs. We explained that we would never be far from the trap while it was armed and ready, and that no dog would be left in the trap for more than a few minutes. They declined to grant us an exemption. They didn't say why, but I can imagine that they did not want to be liable if something went wrong and a dog died while in the trap. For that same reason, I can't officially recommend that you use this trap in Washington state, even if it would be a safe and effective option for catching your dog. However, the trap is perfectly legal in most states, and animal control officers having been using it successfully for years. Do check the law in your state, and see if this trap might be right for you. I would never recommend it as the first thing to try when capturing your own dog, but if you have tried everything else recommended in the guide in the back of this book, then it may be right for you in certain situations. You should definitely be absolutely certain that you are following all of the detailed instructions. If you are not the sort of person how follows directions well, then have a friend or relative set it up for you. Besides some laws prohibiting snare traps, you may find other laws working against the owner of a lost pet. Local laws and regulations about signs are the most common obstacle for someone looking for a lost cat or dog. The sign laws are necessary to control the proliferation of signs for roofing companies, house buyers, tree services, garage sales, concerts in small venues, and many other sorts of signs for local, time-sensitive services and needs. Personally, I think laws should be amended so that lost pet signs can be placed on local utility poles. The problem of lost pets would be helped the most if there were laws against selling dogs and cats as a profit-making business. The only reason you should be selling a dog or a cat is so that you can help that animal, not so that you can make a buck. If you are a breeder, you should be breeding for the health of the dog and the preservation of the breed, not breeding in order to maximize your profits. If people would stop trying to make money off of the breeding of pets, most of our problems of lost, homeless, and unwanted pets would be solved overnight. Another way the law can work against dog owners is that it is absolutely legal for a law enforcement officer to shoot your dog for no reason at all. A cop almost never suffers any consequences for shooting a dog, even if it's a fluffy little friendly dog or if the dog is running away at the time. A law enforcement officer need only say that he felt threatened, and he would not be held responsible for his actions. Even when cops have killed dogs in ways that were clearly illegal, they have not been held accountable. The lives of cats and dogs could be improved and made safer if we advocated for changes in key laws and regulations. Most laws pertaining to companion animals treats them as property, not as family members. It is time for our laws to catch up with modern thinking about animal welfare. Hopefully, a valuable tool like the Collarum trap will be legal in all states some day. Laws won't change unless people who care about cats and dogs, as members of their families, demand that these laws be changed.